Respect Our Seas gathers together all those who are concerned by the current state of our seas, and who want to do something about it. Welcome to the Marine News Roundup. We hope you enjoy the fortnight's highlights - please feel free to comment below and let us know what you think! Adaptation is fundamental for a species to survive, especially in hostile environments like the Arctic. When faced with six months of perpetual darkness where snow and ice lays claim to every inch of the land. What kind of extraordinary animals survive in such harsh terrain, and more importantly, how do they do it? During winter in the Arctic, temperatures can drop to a bone-chilling −50°C (−58 °F). Rather than going into hibernation however, some animals will stick out the winter and use their cold-conquering adaptations to survive. This BBC Earth blog takes a look at the Arctic Fox, and the Walrus - a master at retaining body heat. 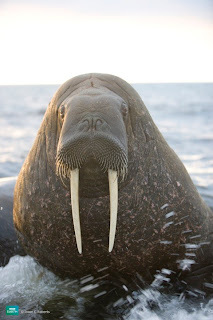 Walrus are covered with short coarse hair that becomes less dense as they get older. Their skin which is folded and wrinkled can be up to 4 cm thick serving as a great insulator. This tough skin is the thickest on the neck and shoulders of adult males where it also serves as a defensive purpose – when these bulls spar the thick skin is intended to resist tusk penetration. They have a deposit of fatty tissue that is up to an astounding 15 centimetres (6 inches) thick - in winter it may make up to a third of their body mass. As well as being an excellent insulator it also streamlines the body and is used as an energy reserve. Their outer defences serve as a pretty hardy armoury but even this thickest of ‘winter coats’ is not sufficient when diving to depths of over 180 meters for nearly half an hour at a time, so the walrus has another trick up its sleeve. When they enter the cold arctic water they become paler because they have a mechanism that restricts blood flow to the skin in order to reduce heat loss. Conversely, when walruses are warm their skin is flushed with blood and they appear to be very red. The adaptations that allow animals to live in such a hostile environment are incredible; join us again when we check out some even more incredible adaptations – those of the animals who inhabit the coldest place on earth, the Antarctic. Our world may be very big, but sometimes it is the smallest stories that teach us the most. BBC Earth brings you three incredible videos where an innovative use of technology has captured the true magic of nature. Click the link above the view all three videos. Developing technology to capture the minuscule and the marvelous is one thing, but what happens when what you’re trying to film is located underneath eight feet of solid ice? Producer Neil Lucas gives us an insight into the incredibly rewarding, but painstaking task of filming in these challenging conditions. Armed with a passion for the natural world and the desire to communicate its incredible stories, BBC Earth filmmakers will continue to surprise and delight us for years to come. Animal experts this week have successfully removed tangled fishing line from a dolphin calf off the coast of St. Petersburg, according to NOAA. The calf and its mother were first spotted in late July, but were not seen again until late October. The calf was entangled in fishing line that was cutting deeply into its mouth and dorsal fin. The calf was successfully located this week during the first rescue attempt, within a quarter mile of the Veteran's Park boat ramp just after sunrise. The calf was restrained and it was discovered that the line was running through the calf's mouth, cutting into its jaw, wrapping around its right flipper and cutting several inches into the dorsal fin. Once the line was removed, the calf was given an antibiotic and released. The government has been accused of failing the environment after announcing delays to the creation of marine reserves. Conservation groups responded angrily to the announcement by environment minister Richard Benyon that the internationally agreed deadline for creating marine protected areas will be missed. They accused the government of changing the rules at the last minute on how valuable marine habitats should be identified to protect them from destruction by vested interests. In his statement Mr Benyon said that the government wanted more evidence gathered before it made a decision on which locations, and the wildlife in them, should get priority for protection. But conservation groups quickly pointed out that the government had, from the outset of the process of identifying where a network of marine reserves should be created, accepted there was a shortage of detailed scientific evidence of what lies beneath the waves and that suggestions should be assessed on the basis of “the best available evidence”. The fear is that when there is a lack of evidence about a location, vested interests such as fishing, aggregates, oil & gas, and renewable energy schemes, will be allowed to exploit the area when in reality they harbour rare or valuable animal communities. The demand for more evidence means the first marine conservation zones, as part of the Marine and Coastal Access Act, will not be in place until at least 2013. It also means that just a fraction of those initially promised form the first tranche. WWF has released a new study showing current fishing capacity doubling bluefin tuna quotas in the East Atlantic and Mediterranean and points to the need to strengthen the current capacity reduction plan. In addition, WWF urges the International Commission for the Conservation of Atlantic Tunas (ICCAT) this year to ban bluefin tuna farming. WWF says it will focus on assessing implementation of the current bluefin tuna recovery plan. In addition the Mediterranean swordfish will be high on the agenda. WWF urges ICCAT to adopt a management plan for this species, the first one ever. Although efforts have been made in the last few years, new reports suggest that IUU fishing remains widespread in the Mediterranean, particularly in Libyan waters but also in Italy. The new WWF study on the fishing capacity of the Mediterranean bluefin tuna fishery points out that huge overcapacity is still prevalent. In the period 2008-2010 estimates of potential annual catches amount to between 31,500-34,000 tonnes, considerably higher than the current TAC, leaving ample room for IUU fishing. According to WWF, sustainable management of the bluefin tuna fishery still needs to be achieved and IUU must be fully eradicated. In particular WWF urges ICCAT to ban fishing in Libyan waters and to turn this area into a BFT Sanctuary. Regarding tuna farming, WWF says a recent scientific study submitted to ICCAT Scientific Committee (SCRS) this year shows that biomass growth in farms is typically much lower than that reported by the farming industry (only 20-30%, compared to given values of over 100%), which raises concern over the potential for laundering bluefin tuna catches in Mediterranean farms. Full traceability in farms continues to be impossible as there is no way to know how much tuna is transferred to the farms. WWF urges ICCAT to ban bluefin tuna farming and to adopt an electronic catch documentation system (BCD) to allow for real time traceability. On swordfish, WWF calls on ICCAT to adopt a science-based recovery plan this year including a mandatory capacity reduction multi-annual plan. San Francisco's federal government missed a court-ordered deadline today to protect habitat for endangered leatherback sea turtles off the U.S. West Coast. Instead of publishing its final rule to protect the turtles, the National Marine Fisheries Service sought a delay from federal court, leaving the increasingly rare leatherbacks vulnerable to threats from fishing, new coastal development, offshore energy and aquaculture. Oceana, TIRN and the Center for Biological Diversity have asked the court to deny this latest attempt by the Fisheries Service to delay protections for the ancient turtles. The request comes after years of repeatedly missed deadlines, lawsuits and a settlement agreement that already gave the Fisheries Service nearly an additional year (until November 15th 2011) to finalize overdue critical habitat protections for the imperiled animals. In order to survive, leatherbacks need safe passage from nesting beaches 6,000 miles away in remote Indonesia to feeding hotspots in Pacific Ocean waters off California, Oregon and Washington. Protection of the key migratory corridors and feeding areas in these waters were elements of the critical habitat designation. Once established, habitat protection could limit activities that harm the leatherbacks’ main prey, jellyfish, or impede their migratory path. The largest of all sea turtles, leatherbacks can grow to be up to nine feet long and weigh up to 1,200 pounds. Pacific leatherback sea turtles have declined more than 95% since the 1980s; as few as 2,300 adult female western Pacific leatherbacks remain. The species has survived for 100 million years virtually unchanged; now it risks disappearing. There has been a rise in the number of migrating whales. They travel on a 5,000km (3,100 miles) round trip to give birth off the coast of Australia before heading back to Antarctica to their main feeding grounds. It is the highest number seen in half a century. Duncan Kennedy reports from Sydney is this BBC video. Only a tiny fraction of sharks caught in the Atlantic – less than 1% – are under protection, even though most shark species are heading towards extinction. Officials from 48 Atlantic fishing countries are meeting in Istanbul this week to try to protect bluefin tuna, swordfish and other large fish. But existing conservation efforts are only saving a tiny proportion of sharks, the report from the Oceana conservation group said. Conservation groups at the International Commission for the Conservation of Atlantic Tuna (Iccat) meeting are pushing for a ban on the catch of porbeagle and silky sharks – which are at extreme risk – as well as catch limits on other species such as the shortfin mako shark. Three quarters of the wide ranging shark now being caught in the Atlantic are under threat, the report said. But Iccat countries to date have only limited protection for specific shark species such as the bigeye thresher, hammerhead and oceanic whitetip sharks. There are no limits on the fishing of 15 Atlantic shark species even though some – such as the silky shark – are close to extinction. Conservationist groups hope the Istanbul meeting will build on recent momentum on shark conservation. But it is a race against time. Sharks were not built for reproduction. They can take take years to reach sexual maturity, and produce only a few pups. And highly mobile animals are notoriously difficult to protect. Atlantic fishing countries reported catching more than 68,000 tonnes of shark in 2009, or more than 1.3 million animals. Most were caught inadvertently by vessels targeting tuna and other fish. Populations of some species, such as the porbeagle, which are caught for their meat as well as their fins, have fallen by 99% since the middle of the last century. Scientists estimate it could take up to 34 years for populations to recover – even with the new EU protections. Fishing of porbeagle sharks continue in Canadian waters. Three other shark species are also at high risk: silky sharks, shortfin mako, and blue sharks, the report said. HR Wallingford, the international hydraulic and environmental engineering consultancy, has formed a partnership with Loughborough University to develop a new underwater acoustic propagation and noise-impact model. Designed to work with proven HR Wallingford ecological models, the new model is an important first step in assessing the impact of underwater noise on fish and sea mammal behaviour. It can be applied in marine renewable energy, oil and gas extraction, dredging and other settings. The significant noise generated by marine construction and operation, and its possible effects on marine life, have come under increased scrutiny worldwide. Where activities take place in and near sensitive marine areas, there is particular concern. Within the European Union, sound is now a recognised pollutant at both project and regional seas levels. In the UK, construction has started of ‘Round 3’ windfarms, some of the largest to be built in British waters, and there is an urgent need to understand their impact on marine life. The model uses temporally and spatially varying parameters such as tidal water depth, flow velocity, salinity, temperature and bathymetry from HR Wallingford’s hydrodynamic model simulations. Modelled noise amplitude and frequency are used as inputs, or ‘behavioural cues’. These are then inputted into HR Wallingford’s established and successful dynamic ecological response models, enabling users to assess marine-species responses to human disturbances. Close to forty thousand gannets spend the breeding season on Grassholm each year, making it a raucus, bustling seabird haven. Most of the birds leave in Autumn, but a few stragglers remain. Sadly, some of these remain because they are tethered to the ground by plastic line, strapping bands, nets, and other materials which the birds use for their nests. MCS Communications Manager, Richard Harrington, and Litter Policy Officer, Dr Sue Kinsey, spent the day with Grassholm's RSPB wardens. They saw the entrapment first hand, and helped free some of the ensnared birds. Most trapped birds we found were ensnared by one or both legs. The material would have wound itself many times around as the bird struggled to free itself, giving no chance of escape. It was satisfying to cut this from an otherwise healthy bird, and especially so when one or two of these immediately flew out to sea. Of the other survivors, wings would be snagged and sometimes broken, or bills and necks wrapped in a tight loop of line; these could be freed, but not always saved. Some carcasses on the ground showed signs of having swallowed quantities of line and fabric. In total, twenty seven birds were freed, each with a better chance of survival than before. This was an improvement on the previous year, when more than a hundred chicks had needed assistance. The sheer volume of plastic material on view is striking, but warden Greg Morgan explained that it just isn’t practical to remove it, and would ruin the fabric of the nest sites to do so. He has taken sample sections from a nest, finding decades-worth of accumulation put together by generations of gannets. Anything resembling a colourful bit of seaweed has been used. Balloon ribbons and attachments are commonplace, and lengths of pipe (a little like kelp stipes) stand proud of the floor. They will be there for many generations to come. The birds freed represent only a tiny fraction of the site’s breeding population and so, despite the obvious suffering, it can’t be considered a threat to the species’ continued existence here. It does, however, serve as a graphic reminder of just why MCS needs to keep up the anti-litter message, and to seek to find ways to reduce the sheer volume of waste entering the sea. A 6ft conger eel has been released into the wild so he can find love after a lifting operation involving a crane. The conger eel, called Rip, left Macduff Marine Aquarium in Aberdeenshire to swim to the Atlantic. Staff said he had become restless, a typical sign that the time had come for a 2,000-mile migration. The eels are known to congregate in deep water, where they spawn before dying. Operation Rip Tide was carried out on Monday afternoon. Rip has been at the aquarium since 2004. A large bag was used to catch the conger eel and a crane was used to hoist him out, lowering him into sea, where divers opened the bag. Claire Matthews, the aquarium manager, said: "We hope Rip makes it to the Azores, but of course the sad part of the story is that he will die after it all - but at least he'll be happy." In 2001, Chippie the conger eel was released at the aquarium for the same journey in Operation Amour. An underwater volcano near El Hierro in the Canary Islands has begun erupting near the shore, reports Reuters. The eruptions may be spectacular, but officials have also noticed that the volcano is spewing toxic gases into the air around the island. After a worker studying the volcano became ill, several of the island's beaches were closed. In the video, a local explains that the volcano is also making the island's cats act strangely and eat dead fish. The volcano, which is just over 200 feet from the surface, began erupting a week ago and is shooting magma 65 feet into the air. The eruption is the first in the Canaries since 1971 and locals are already speculating that it may create a new island. Despite the beach closures and dead fish near the island, the island's human population is safe. Rescuers are racing against the clock to save two huge sperm whales stranded on a Tasmanian sandbank after 22 others died, the Parks and Wildlife Service says. Marine mammal specialists were on site in Macquarie Harbour at Strahan on Tasmania's northwest coast, but it was proving to be a slow process. Twenty-two of the whales weighing two tonnes and up to 12-metres- (40-feet-) long washed ashore on Saturday at Ocean Beach near Strahan and all of them died. Four others came into the harbour and stranded themselves on a sandbank. Two were successfully refloated and swam back out to sea but two remained stuck. Tasmanian Parks and Wildlife incident controller Chris Arthur said sperm whales were so big they could not simply be pulled into deeper water by volunteers. Conditions were worsening with high winds and seas hampering efforts, but Arthur expressed confidence after seven sperm whales were saved in a similar stranding in the harbour in 2007. Whale beachings are relatively common in Australia, and they usually occur in the summer months around December around Tasmania. Rising sea levels in the coming centuries is perhaps one of the most catastrophic consequences of rising temperatures. Massive economic costs, social consequences and forced migrations could result from global warming. But how frightening of times are we facing? Researchers from the Niels Bohr Institute are part of a team that has calculated the long-term outlook for rising sea levels in relation to the emission of greenhouse gases and pollution of the atmosphere using climate models. The results have been published in the scientific journal Global and Planetary Change. "Based on the current situation we have projected changes in sea level 500 years into the future. We are not looking at what is happening with the climate, but are focusing exclusively on sea levels," explains Aslak Grinsted, a researcher at the Centre for Ice and Climate, the Niels Bohr Institute at the University of Copenhagen. He has developed a model in collaboration with researchers from England and China that is based on what happens with the emission of greenhouse gases and aerosols and the pollution of the atmosphere. Their model has been adjusted backwards to the actual measurements and was then used to predict the outlook for rising sea levels. The research group has made calculations for four scenarios: a pessimistic one, an optimistic one, and two more realistic ones. In the pessimistic scenario, emissions continue to increase. This will mean that sea levels will rise 1.1 meters by the year 2100 and will have risen 5.5 meters by the year 2500. Even in the most optimistic scenario, which requires extremely dramatic climate change goals, major technological advances and strong international cooperation to stop emitting greenhouse gases and polluting the atmosphere, the sea would continue to rise. 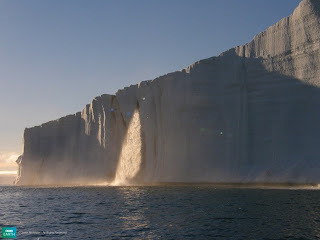 By the year 2100 it will have risen by 60 cm and by the year 2500 the rise in sea level will be 1.8 meters. For the two more realistic scenarios, calculated based on the emissions and pollution stabilizing, the results show that there will be a sea level rise of about 75 cm by the year 2100 and that by the year 2500 the sea will have risen by 2 meters. A 40ft-long whale has been successfully freed from fishing gear off the coast of East Lothian. The humpback was reported trapped in a boat's nets on Tuesday. It escaped but was then trapped again in a line of creels off the Dunbar coast. The whale had suffered serious injuries to its back and dorsal fin but experts believe it will make a full recovery. A team from the British Divers Marine Life Rescue was helped by Dunbar Lifeboat. That's all for this edition of the Marine News Roundup - there will be another in two week's time. Save Our Marine Conservation Zones! Urgent - help us stop the back tracking! An alarming new threat is facing England’s seas. Over the past two years Devon Wildlife Trust has worked with a whole range of groups including fishermen, divers and recreational boat users to agree on areas of our seas that need protection. Nationally 127 areas - Marine Conservation Zones - have been identified that are absolute musts. These include the north Devon coast and Torbay seagrass beds. In a last minute change of heart the Government is threatening to pull out of three quarters of these havens. We must not let this happen. Here is the latest Marine News Roundup, bringing you the best marine news stories of the past two weeks! An insightful piece by BBC Earth about the sonic wonders, or rather phenomenon, of our planet. From a mighty clap of thunder to the subtle rustling of leaves, everywhere we go it feels as though we are immersed in sound. BBC Earth decided to hunt down some of the planet’s lesser known sonic wonders, including speaking sands, stirring ice and mysterious seas. The ferocious noise made by popping or cracking ice maybe a worrying sound to the lay ear - particularly if you are stood on top of it at the time. However to researchers working in the field of climate science the groaning of the polar landscapes is music to their ears. Scientists have started to record the sound that the ice makes as it recedes, using hydrophones to measure the amount of glacial melting. Mapping the sea floor using sonar is not a new phenomenon but in this new application instead of sending pulses of sound to the sea floor and timing their return, glaciologists just simply listen. Looking at the interface between ice, ocean, and bedrock it may be possible to use acoustics to measure the glacial melt. The familiar sounds of the sea are captured in the incredible soundtracks of natural history documentaries as well as inside seashells when they are held up to our ears. The sound transports us to the blue planet that covers over 70 percent of the Earth’s surface. In the summer of 1997, a number of hydrophones in the Equatorial Pacific Ocean picked up a bizarre new sound phenomenon. The underwater microphones picked up a signal that rose rapidly in frequency for about a minute before disappearing. The sound was picked up repeatedly by US government microphones for the duration of that summer but has not been heard since. It became known as ‘The Bloop’ and was detected by sensors over a range of 5,000 kilometres. Initial tracking suggested that the sound profile of ‘The Bloop’ was comparable to that of a living animal. However it was far louder than any whale song ever recorded. The mystery remains just a drop in the ocean of the hundreds of mysterious sounds that make our planet a sonic wonder. BBC Earth produced a wonderful video for Halloween this year, including some stunning underwater shots of some scary marine life. Enjoy! Animal tracking provides new means to assess far-reaching environmental impacts. In the aftermath of the Deepwater Horizon explosion in the Gulf of Mexico, a long-distance migrant, the northern gannet (Morus bassanus) suffered the highest oiling among beach-wrecked birds recovered. Analysis of bird-borne tracking data indicated that 25% of their North American population from multiple colonies in eastern Canada migrated to the pollution zone. Findings contrasted sharply with available mark-recapture (band recovery) data. The timing of movement into and out of the Gulf indicates that immature birds would have absorbed most oil-induced mortality. Consequently, one of two outcomes is likely: either a lagged (likely difficult to assess) population decrease, or an undetectable population response buffered by age-related life-history adaptations. Tracking research is especially useful when little information on animal distributions in pollution zones is available, as is the case in the Gulf of Mexico. Ongoing research highlights current risks and conservation concerns. The Cincinnati Zoo plans to return a manatee to the wild as part of a U.S. Fish & Wildlife Service rescue and release program. A 978-pound Florida manatee named Illusion arrived at the Cincinnati Zoo & Botanical Garden about a year ago and will be returned on November 9th. She'll remain on exhibit until November 8th. The manatee suffered fractured ribs and vertebrae in March 2010 when a boat propeller cut through it in Palm Beach County. It was taken to the Cincinnati Zoo by the Miami Seaquarium. The zoo says the manatee is the eighth it has rehabilitated and released. There are no scheduled release dates for Illusion's roommates, Wooten and Betsy. Manatees can live up to 60 years, but human activities account for about one-third of known deaths annually. They’re rarely seen. Even less often photographed. Bryde’s whales rocket through Pacific shallows to gorge on fish. Here, National Geographic showcase some stunning photographs of these beautiful whales. During a July 2011 voyage to the Pacific Ocean chasm, researchers with Scripps Institution of Oceanography at UC San Diego and National Geographic engineers deployed untethered landers, called dropcams, equipped with digital video and lights to explore the largely mysterious region of the deep sea. The team documented the deepest known existence of xenophyophores, single-celled animals exclusively found in deep-sea environments. Xenophyophores are noteworthy for their size, with individual cells often exceeding 4 inches (10 centimeters), their extreme abundance on the seafloor and their role as hosts for a variety of organisms. The body of a four meter-long great white shark was discovered in shark netting on Newcastle's Bar Beach yesterday morning. The creature was initially towed to the Newcastle Fisherman's Co-Op due to an inability to lift the remains from the water with a commercial vessel. Now, the shark's carcass is now being held at the Port Stephens Fisheries Research Centre, where it will be "analysed as part scientific research purposes". Representatives for the centre said that the shark netting acts as important preventative device. "The nets are not set as a barrier, but rather as a technique that deters dangerous sharks from establishing a territory and reduces the risk to swimmers," said a spokesperson. "This program is very successful." A peer-reviewed study commissioned by NOAA shows the American people assign an estimated total economic value of $33.57 billion for the coral reefs of the main Hawaiian Islands. The study shows that people from across the United States treasure Hawaii's coral reefs, even though many never get to visit them. It illustrates the economic value of coral reefs to all Americans, and how important it is to conserve these ecosystems for future generations. The threat to the marine life is growing past the danger mark as a latest research says that the seaweed communities are being killed due to constantly warming oceanic climate. The seaweed is crucial for the existence of many marine species. Given future warming, up to one quarter of species might become extinct, said Thomas Wernberg, assistant professor at the University of Western Australia Oceans Institute, who conducted the study. The researchers studied a database of more than 20,000 herbarium records of macro-algae collected in Australia since the 1940s. They found changes in seaweed communities in both the Indian and the Pacific oceans, consistent with rapid warming over the past decades. Cullercoats lifeboat launched on Wednesday 26 October to save the life of a 12 year old boy who had been swept into the sea in Brown's Bay, Cullercoats. The conditions were so rough that the child was exhausted in a very few minutes - the prompt call by his friends to the Coastguard for assistance helped save his life. Sea conditions produced a 4m swell, which meant that the boy was unable to help himself. Cullercoats lifeboat crew (Robert Oliver, Grahame Wood and Stephen Potts) launched at 3.58pm. They raced in their inshore lifeboat Hylton Burdon to the scene and plucked the exhausted, hypothermic youngster from the sea while he was in the last stages of consciousness in the extremely cold water. Returning to the lifeboat station in Cullercoats Bay, the boywas given oxygen and warmed up while waiting for the Air Sea Rescue helicopter from RAF Boulmer. He was flown to Wansbeck Hospital in Ashington for further treatment. Later reports indicated that he is recovering from his ordeal. Fish from European waters will be distributed to the poor as an alternative to throwing them away at sea, the EU fisheries chief told MPs on Thursday, as part of a sweeping reform of marine policy. Maria Damanaki, the European commissioner for fisheries, said that as part of a proposed new deal with fishermen aimed at ending the wasteful practice of discarding edible fish at sea, lower value fish could be distributed to charities and other public organisations. Appearing before the House of Commons select committee on environment, food and rural affairs, she said: "We can use these for charitable purposes, [though] we will have to give fishermen compensation if they give fish to the poor." Damanaki is seeking the most wide-ranging reform of the EU's common fisheries policy since it was formulated more than four decades ago. Key to the reforms will be an end to the practice of discards, by which as much as two-thirds of the catch of some species are abandoned at sea, almost all of them to die. About 1m tonnes are estimated to be thrown back each year into the North Sea alone. Discards are a byproduct of the rules on fishing quotas – when fishermen exceed their allowance, or net species for which they lack a quota, they must throw the excess back. But the commissioner faces stiff opposition from fishing groups and some member states, because forcing fishermen to land all their catch will mean lower incomes. Current practices allow fleets to discard damaged fish, or lower value species, for which they receive less money, in order to maximise their profits. Pathology experts contracted by NOAA have identified the bacteria Brucella in five bottlenose dolphins that died in the northern Gulf of Mexico. These five are among the 580 dolphins in higher than expected strandings that began in February 2010 and are continuing. NOAA has declared it an “unusual mortality event,” triggering a focused, expert investigation into the cause. Brucella bacteria are commonly found in populations of marine and terrestrial animals throughout the world, but infection in humans is rare in the US, and there are no documented U.S. cases of Brucella in humans originating from marine sources. On Saturday 29th October, more than 40 divers participated in the third annual Underwater Pumpkin Carving Contest at the Grand Lagoon Yacht Club in Pensacola. MBT Divers and the Grand Lagoon Yacht Club hosted the event, which included more than 25 students from the University of West Florida SCUBA Club. Participants braved the chilly morning wind and slipped into their wet suits and scuba gear as dolphins frolicked about 20 yards away. Divers in teams of two waded into the nippy water with pumpkins and various carving tools in hand and took to the difficult task of underwater carving. The event was as much a spectator sport as it was a dive event: more than 30 people watched from the nearby dock, which provided the perfect viewing spot as divers disappeared underwater with their bright orange pumpkins. Within minutes, the water's surface was dotted with hundreds of pumpkin seeds and entrails - which the gulls and small fish were only too happy to eat. SeaWorld Parks and Entertainment can intervene in a lawsuit that would shield pictures and videos of a whale trainer being drowned by an orca last year, a federal judge ruled. The video and photographs show animal trainer Dawn Brancheau being dragged by her hair and drowned by Tilikum, a 20-foot-long male orca at SeaWorld's Shamu Stadium in Orlando. Brancheau was killed during a February 24th 2010, "Dine With Shamu" show. Witnesses eating dinner near a subterranean viewing tank said they saw Tilikum playing with the corpse. The US Secretary of Labor and Occupational Safety and Health Administration released at least one video of the drowning to the media. OSHA also has photos taken immediately after the incident showing Dawn's personal effects and clothing, and two surveillance videos showing her death and rescue efforts. The sheriff's office and medical examiner who investigated the death agreed to keep the materials confidential. Apart from using the materials against SeaWorld, which it fined $75,000 for violations of the Occupational Safety and Health Act of 1970, the government is not seeking to release the video. But Brancheau's family has fought to make sure that those with access to the videos never have the chance to release them. Bangladesh is declaring three areas in the southern Sundarbans mangrove forest as dolphin sanctuaries to protect freshwater dolphins, officials say. Conservationists say the mangrove forest is the only place in the world where the Ganges river dolphins and Irrawaddy dolphins are found. These dolphins are among the world's most endangered mammals. Fishermen normally do not target them, but the animals get entangled in fishing nets and drown. They are also threatened by rising salinity levels and pollution. Environmentalists say the diverse aquatic ecosystem of the Sundarbans support an impressive variety of cetaceans - whales, dolphins and porpoises. While Ganges river dolphins find safe haven in the upper regions of Sundarbans, Irrawaddy dolphins thrive in the southern parts, which are closer to the Bay of Bengal. The decision by the forest department coincided with a new survey by the BCDP which, apart from freshwater dolphins, also reported sightings of the finless porpoises and an Indo-Pacific humpback dolphin in western Sundarbans. These two cetacean species, which are normally found along the coast, migrate upriver in Sundarbans mostly during winter, when the salinity level is high. They go back after fresh water starts flowing into the rivers. The nine-day survey was conducted in the western part of Sundarbans mangrove forests earlier this month. Two years ago, researchers found that there were nearly 6,000 Irrawaddy dolphins - which are related to orcas or killer whales - in the waterways of Sundarbans mangrove forests and the nearby coastal waters of the Bay of Bengal. And finally, as part of the BBC's Frozen Planet series, BBC Earth have blogged about the race across the Antartic wilderness by two teams 100 years ago. Led by Roald Amundsen from Norway and Captain Robert Scott from Great Britain, the men set out to conquer this vast icy continent and to become the first to reach the South Pole. For one group the adventure would end in triumph, for the other it would end in tragedy. This year marks the 100th anniversary of Scott and Amundsen’s separate attempt to be the first to the South Pole. The adventure began more than 10 years earlier, in 1897, when a great, global effort to uncover the mysteries of Antarctica began. People knew that a huge, frozen continent lay beyond the wild seas at the southern end of the Earth, but it wasn’t until 1820 that explorers first laid eyes on Antarctica. Before then ships had failed to penetrate far enough through the frozen ocean to carry their passengers within sight of land. During the winter of 1897, a Belgian ship carrying a crew of explorers, called the Belgica, was trapped in the ice off the coast of the continent. The crew became the first people to endure an Antarctic winter and sparked a period of exploration that would last for 25 years. During that time scientists, geographers and adventurers would compete to become the first to explore uncharted territories and claim the credit for their respective nations. But it was the parallel journeys of Scott and Amundsen that would capture the imaginations of people across the world. Scott had been planning his Terra Nova Expedition for years. His aim was to be the first to the South Pole after Ernst Shackleton had narrowly failed during an earlier expedition. Scientific research was also an important part of Scott’s expedition to Antarctica. 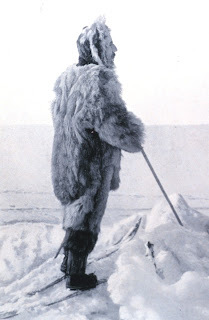 But when the American adventurers Frederick Cook and Robert Peary laid claim that achievement, Amundsen turned his attention towards the other end of the Earth. Only his brother Leon and second-in-command Thorvald Nilsen knew of Amundsen’s plan until after his ship, the Fram, had set sail. Scott only learnt of this change of direction months later when his ship, the Terra Nova, docked in Melbourne, Australia. There he was handed a telegram from the Norwegian, it read: ‘Beg to inform you Fram proceeding Antarctic – Amundsen.’ Even though Scott publically insisted that this news would change nothing, the reality was that he was now locked in a race to the South Pole. That's it for now - there will be another Marine News Roundup in two week's time. Please free to comment and let us know what you think! Respect Our Seas gathers together all those who are concerned by the current state of our seas, and who want to do something about it. Respect Our Seas was founded in 2008 by Amy Bugg, BSc (Hons) Marine Biology and Coastal Ecology. Amy has a passion for marine life, conservation and ecology and wanted to find a way she could spread her enthusiasm about the ocean to others. Respect Our Seas is dedicated to inspiring people to care for and protect our seas in any way they can, whether through individual action or by supporting organisations that look after the marine environment and it's wildlife. Two thirds of our planet is covered by ocean, yet we know more about the surface of the moon than we do about the ocean floor. The ocean provides 70% of our planet's oxygen. It plays a crucial role in our lives and exists in a delicate balance, yet we continue to exploit it every day. We urgently need to Respect Our Seas and STOP exploiting our oceans. We need to STOP polluting our seas. We need to do everything we can to preserve them and their precious wildlife, before it's too late.